I really don't think I could ever be a monogamous sock knitter and I can't remember the last time I had only one pair of socks on the needles. As I was tidying up my knitting needles (re: finally putting away all the needles that I stuck into a leftover yarn cake on my desk...come on now, don't tell me you've never done this before! ), I was shocked to find that I had quite a few pairs of sock needles with nothing on them. What? I took a quick inventory of my sock WIPs and sure enough, I had only one pair of socks on the go. Surprised doesn't even begin to describe how I felt at that discovery. So I grabbed the closest skein of yarn and quickly cast on another pair of socks. I needed a plain vanilla sock on the needles anyways. While the Harvest Dew socks stitch pattern is super easy to memorize, I needed something extremely simple and mindless to keep in my handbag, to take with me while I waited in the school pick up area, and to knit on while I continue to embark on a Star Trek: The Next Generation marathon (yes, all seven seasons...would you believe the Mister has never watched them before??). The yarn that I just happened to have by my desk is Regia's Pairfect in colourway #7117. Such a thrilling colourway name, wouldn't you agree? Although, if you look on the Regia website you can find out what the actual names for their colourways are. The one I'm using in particular is called "Cheesecake". Why? I'm really not sure. But whatevs. I'm going to call these socks my Cheesecake socks from now on. I had no choice but to cast on a cuff-down sock due to how this yarn works. 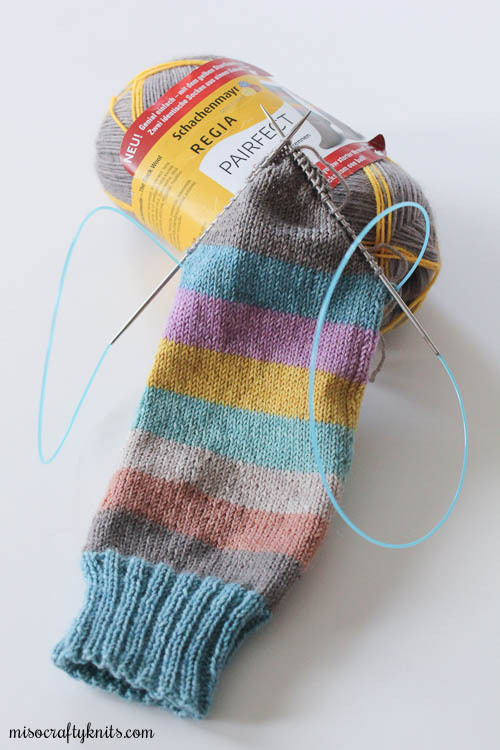 In case you're not familiar with Pairfect, Regia decided to create an "incredibly easy way to knit two identical socks from one skein" (their words, not mine). There's no need to weigh the yarn or to divide the skein in half. All you need to do is grab the yellow "Easy Start" starter thread (they even make this fool proof by wedging it into the notch on the label!! ), cut it off and cast on the first sock. Once you're done the first sock all you have to do is unwind the yarn until you get to the next yellow starter thread and repeat the whole process again. Crazy, right? Now, if you're the type that only knits two-at-a-time, this isn't for you. And if you only knit from the outside-in then this won't be for you either. These skeins are of the center-pull variety. I suppose you can start from the outside in but then you would have to know for sure how much you would have to knit before you get to the fun self-striping bit, and be ok with not utilizing the stripes to its full capacity. Also, as far as I can tell, this line is pretty much for those who knit cuff-down socks. You can try toe-up but again, you'd have to accept the fact that all the fun would be on the foot and not the leg, or go from the outside-in and risk cutting off the striping section pre-maturely. If you're determined enough I'm sure you can go against the grain and still produce a beautiful pair of socks, but I think that would beat the whole purpose of Regia's sock yarn innovation for easy peasy, fool-proof matching socks. If you have accomplished this feat though, please let me know! I'm quite curious. So far I'm pretty happy with how my sock is turning out. I've cast on my usual amount of stitches (64 sts, in case you're wondering) using the twisted German cast-on method, and started knitting a 2x2 rib. I'm quite chuffed that the cuff turned out to be 2" high - exactly the length I prefer my cuffs to be! I was a little worried that the sock will be too long since I know my legs are much shorter than the typical leg that this yarn was meant for, so I decided to start the heel immediately after the last stripe. I should have gone with a traditional heel flap but without thinking I started a Fish Lips Kiss heel. I was too lazy to rip it out. Oh well, next time. I am not a sock knitter, but this yarn sounds like a fun place to start! The colorway is gorgeous - I've a love affair for matching everything with grey lately, but it really does go with everything! I have to agree, grey really does go with everything!! I don't blame you for wanting to match everything with grey (I do the same thing!). I would have to see how this pair turns out before I try anything different with the other skein I have of this yarn. I kind of like the idea of footie socks! ooh, that is exactly how I knit my socks- this would be perfect for knitters like me. I'll have to look for it- and I love this colourway, too. I hope you find a skein!! This first sock has been fun and interesting...and addictive in the sense that I have no idea how this sock will actually work out!